To estimate the posterior distribution of a standard Bayesian linear regression model, see estimate. PosteriorMdl = estimate(PriorMdl,X,y) returns the model that characterizes the joint posterior distributions of β and σ2 of a Bayesian linear regression model. estimate also performs predictor variable selection. PriorMdl specifies the joint prior distribution of the parameters, the structure of the linear regression model, and the variable selection algorithm. X is the predictor data and y is the response data. PriorMdl and PosteriorMdl are not the same object type. To produce PosteriorMdl, estimate updates the prior distribution with information about the parameters that it obtains from the data. NaNs in the data indicate missing values, which estimate removes using list-wise deletion. PosteriorMdl = estimate(PriorMdl,X,y,Name,Value) uses additional options specified by one or more name-value pair arguments. For example, 'Lambda',0.5 specifies that the shrinkage parameter value for Bayesian lasso regression is 0.5 for all coefficients except the intercept. [PosteriorMdl,Summary] = estimate(___) uses any of the input argument combinations in the previous syntaxes and also returns a table that includes the following for each parameter: posterior estimates, standard errors, 95% credible intervals, and posterior probability that the parameter is greater than 0. Consider the multiple linear regression model that predicts US real gross national product (GNPR) using a linear combination of industrial production index (IPI), total employment (E), and real wages (WR). 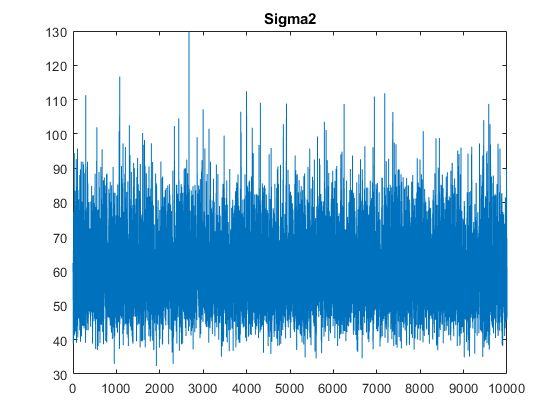 For all t, εt is a series of independent Gaussian disturbances with a mean of 0 and variance σ2. For k = 0,...,3, βk|σ2 has a Laplace distribution with a mean of 0 and a scale of σ2/λ, where λ is the shrinkage parameter. The coefficients are conditionally independent. The order of the shrinkages follows the order of the specified variable names, but the first element is the shrinkage of the intercept. PriorMdl is a lassoblm Bayesian linear regression model object representing the prior distribution of the regression coefficients and disturbance variance. Perform Bayesian lasso regression by passing the prior model and data to estimate, that is, by estimating the posterior distribution of β and σ2. 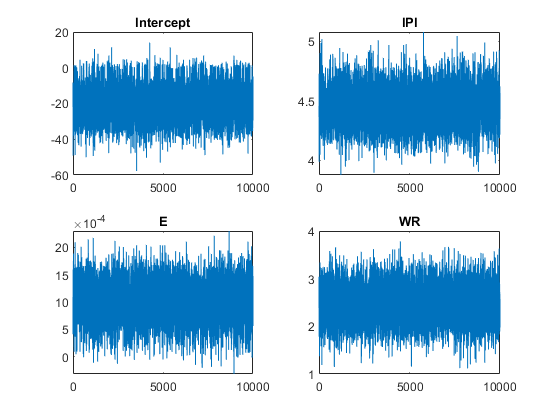 Bayesian lasso regression uses Markov chain Monte Carlo (MCMC) to sample from the posterior. For reproducibility, set a random seed. CI95, which contains the 95% Bayesian equitailed credible intervals for the parameters. For example, the posterior probability that the regression coefficient of IPI is in [4.157, 4.799] is 0.95. Positive, which contains the posterior probability that the parameter is greater than 0. For example, the probability that the intercept is greater than 0 is 0.427. Given the shrinkages, the distribution of E is fairly dense around 0. Therefore, E might not be an important predictor. By default, estimate draws and discards a burn-in sample of size 5000. However, a good practice is to inspect a trace plot of the draws for adequate mixing and lack of transience. Plot a trace plot of the draws for each parameter. You can access the draws that compose the distribution (the properties BetaDraws and Sigma2Draws) using dot notation. The trace plots indicate that the draws seem to mix well. The plots show no detectable transience or serial correlation, and the draws do not jump between states. Consider the regression model in Select Variables Using Bayesian Lasso Regression. 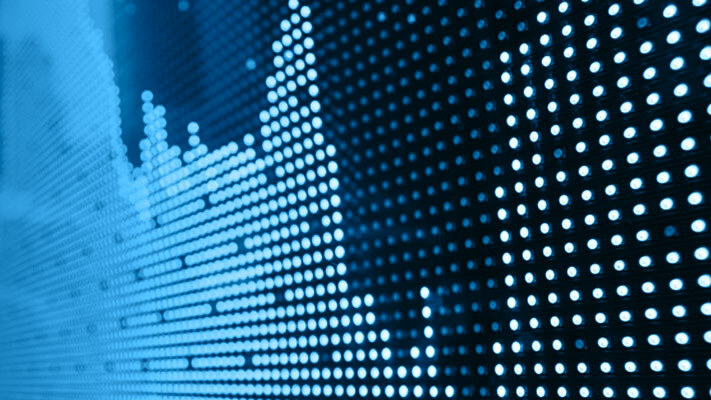 Create a prior model for performing stochastic search variable selection (SSVS). Assume that β and σ2 are dependent (a conjugate mixture model). Specify the number of predictors p and the names of the regression coefficients. Implement SSVS by estimating the marginal posterior distributions of β and σ2. Because SSVS uses Markov chain Monte Carlo for estimation, set a random number seed to reproduce the results. CI95, which contains the 95% Bayesian equitailed credible intervals for the parameters. For example, the posterior probability that the regression coefficient of E (standardized) is in [0.000, 0.0.002] is 0.95. Regime, which contains the marginal posterior probability of variable inclusion (γ=1 for a variable). For example, the posterior probability E that should be included in the model is 0.0925. Assuming that variables with Regime < 0.1 should be removed from the model, the results suggest that you can exclude the unemployment rate from the model. Consider the regression model and prior distribution in Select Variables Using Bayesian Lasso Regression. 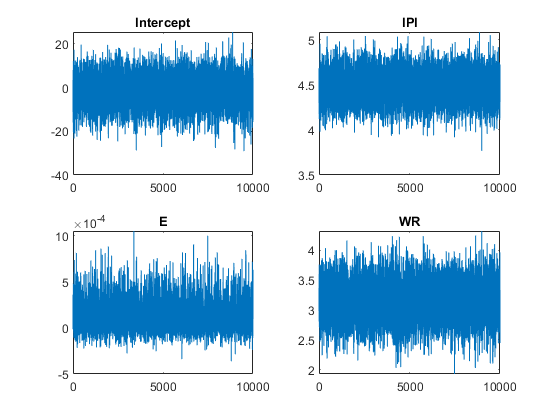 Create a Bayesian lasso regression prior model for 3 predictors and specify variable names. Specify the shrinkage values 0.01, 10, 1e5, and 10 for the intercept, and the coefficients of IPI, E, and WR. Estimate the conditional posterior distributions of β given the data and that σ2=10. Return the estimation summary table. estimate displays a summary of the conditional posterior distribution of β. Because σ2 is fixed during estimation, inferences on it are trivial. Because estimate computes the conditional posterior distribution, it returns the model input PriorMdl, not the conditional posterior, in the first position of the output argument list. Display the estimation summary table. SummaryBeta contains the conditional posterior estimates. Estimate the conditional posterior distributions of σ2 given that β is the conditional posterior mean of β|σ2,X,y (stored in SummaryBeta.Mean(1:(end – 1))). Return the estimation summary table. estimate displays an estimation summary of the conditional posterior distribution of σ2 given the data and that β is condPostMeanBeta. In the display, inferences on β are trivial. Create a prior model for performing SSVS. Assume that β and σ2 are dependent (a conjugate mixture model). Specify the number of predictors p and the names of the regression coefficients. Implement SSVS by estimating the marginal posterior distributions of β and σ2. Because SSVS uses Markov chain Monte Carlo for estimation, set a random number seed to reproduce the results. Suppress the estimation display, but return the estimation summary table. PosteriorMdl is an empiricalblm model object that stores draws from the posterior distributions of β and σ2 given the data. Summary is a table with columns corresponding to posterior characteristics and rows corresponding to the coefficients (PosteriorMdl.VarNames) and disturbance variance (Sigma2). Display the estimated parameter covariance matrix (Covariances) and proportion of times the algorithm includes each predictor (Regime). Regime contains the marginal posterior probability of variable inclusion (γ=1 for a variable). For example, the posterior probability that E should be included in the model is 0.0925. Bayesian linear regression model for predictor variable selection, specified as a model object in this table. Flag to display Bayesian estimator summary to the command line, specified as the comma-separated pair consisting of 'Display' and a value in this table. The estimation information includes the estimation method, fixed parameters, the number of observations, and the number of predictors. The summary table contains estimated posterior means, standard deviations (square root of the posterior variance), 95% equitailed credible intervals, the posterior probability that the parameter is greater than 0, and a description of the posterior distribution (if known). For models that perform SSVS, the display table includes a column for variable-inclusion probabilities. If you specify either Beta or Sigma2, then estimate includes your specification in the display. Corresponding posterior estimates are trivial. Bayesian linear regression model storing distribution characteristics, returned as a mixconjugateblm, mixsemiconjugateblm, lassoblm, or empiricalblm model object. 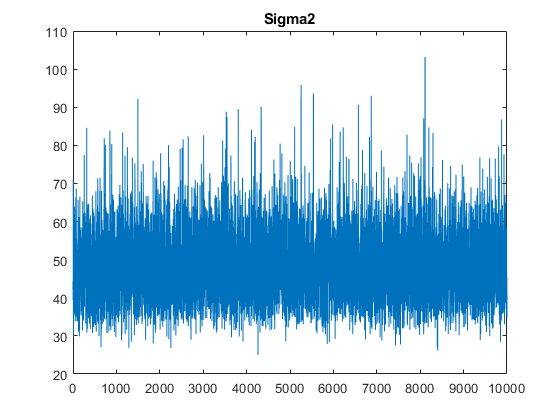 If you do not specify either Beta or Sigma2 (their values are ), then estimate updates the prior model using the data likelihood to form the posterior distribution. 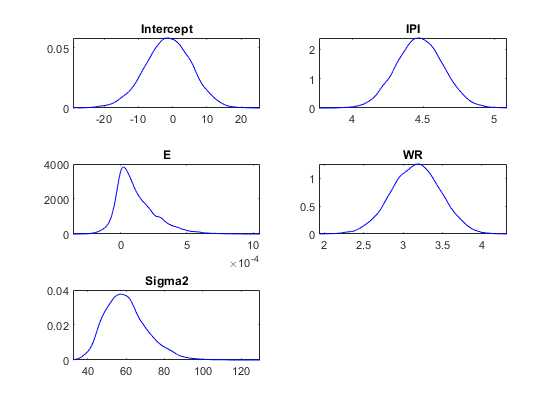 PosteriorMdl characterizes the posterior distribution and is an empiricalblm model object. Information PosteriorMdl stores or displays helps you decide whether predictor variables are important. If you specify either Beta or Sigma2, then PosteriorMdl equals PriorMdl (the two models are the same object storing the same property values). estimate does not update the prior model to form the posterior model. However, Summary stores conditional posterior estimates. This figure shows how estimate reduces the Monte Carlo sample using the values of NumDraws, Thin, and BurnIn.